Excalibur is one of Net Entertainment’s most prestigious Video Slots, and, based on the Legend of King Arthur’s Sword, it darn well should be. If you’re not familiar with the story, legend has it that King Arthur owned a sword with magical powers, called Excalibur. Net Entertainment managed to combine this mythical and ancient theme, alongside modernised, state-of-the-art technology, to offer a diverse, historical, enjoyable gaming experience. Excalibur uses a selection of symbols, including low-paying playing card tokens, as well as high-paying symbols, which includes associates of King Arthur, as well as other game specific symbols. In fact, you’ll be playing along with some of the Legend’s themselves, including Merlin, Sir Lancelot, Lady of the Lake, Morgan, and Mordred. While this may not mean much to some players, if you’re a fan of fantasy, and follow your history, it can add a touch of “depth” to your playing experience, as you find yourself playing alongside some of history’s best-known mythical legends. Playable from 20p a spin, the stake is capped at £80, ensuring most players should find a wagering-point suitable for them. 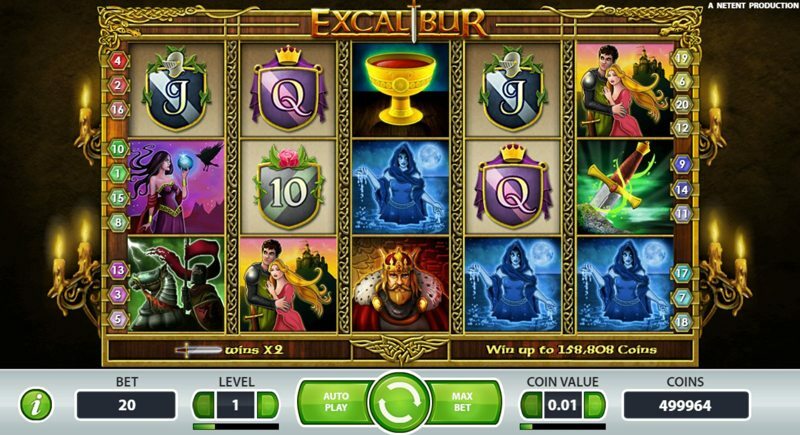 With a range of features, exciting 5-of-a-kind payouts, and an overall high-quality, high-class theme, Excalibur is one of Net Entertainment’s top games, and attracts new players every day. Plus, Excalibur is now available to enjoy on mobile devices, including most phones and tablets running iOS, Android, Windows, or Blackberry software. While not all devices will load the game, as a general “rule of thumb”, if your mobile device can play YouTube or Facebook videos… you should be able to get going with Excalibur with no problems. There’s a few exciting things to look out for while playing Excalibur, and the first is the Excalibur Sword symbol; this acts as a wild, and substitutes for all symbols, aside from the scatter symbols. The wild, however, does more than just substitute – it also applies a 2X multiplier to any win it helps create, allowing for bigger, better paydays. The free-spins feature is triggered by landing three, four, or five of the scatter symbols anywhere in view. 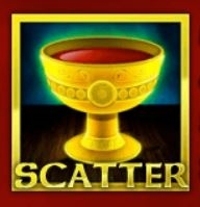 The scatter symbols to look out for is a Gold Chalice, and if you land three, you’ll be awarded 10 free-spins, with 4, and 5 awarding 20, and 30 free-spins respectively. 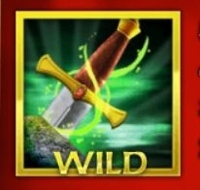 During the free-spins, all your wins are subject to a 3X multiplier automatically, and the Excalibur wild symbol multiplies wins by 4X, instead of 2X, allowing you to win great amounts of money, if you can match up 4-of-a-kind and 5-of-a-kind pay lines. While there aren’t any sticky wilds or similar in the free-spins round, generally you’ll find yourself making a lot more natural wins than you would when compared against the base-game, and this ensures you don’t leave the free-spins round empty handed. As with most Net Entertainment Video Slots, you can re-trigger the free-spins by landing more scatter symbols during the bonus. The number of spins you receive remains the same (so either 10, 20, or 30), although it’s worth mentioning that the free-spins limit is capped at 150.